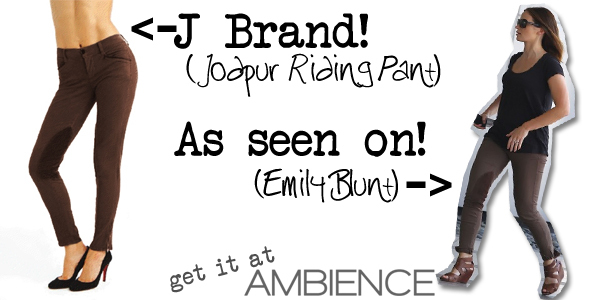 Emily Blunt is seen wearing one of the hottest trends of the season, the J Brand Jodhpur. These brushed velveteen knee patches complement the vintage wash creating a great fashion forward look. Pair these with your boots this fall and you will love the look as you transition into the cooler temperatures. "The J Brand Jodpur Riding Pant in brown are a luxe Japanese twill that feature riding inspired brushed velveteen knee patches, belt loops, front and back pockets, zip and button front closure, outer cuff zippers. These pants are a mid-rise skinny."